Get a handle on outdoor advertising costs. Get all the information you need to get back to your client quickly with full pricing and campaign metrics. Get billboard availability and budget outdoor advertising costs. 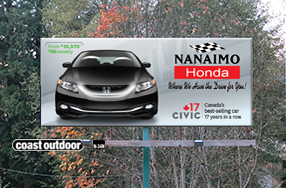 Get billboard ad availability for your proposed campaign with the click of a button. We can chart your billboard campaign for you and get back with specific billboard location availability - usually on the same business day. Book your billboard signs and get creative specifications. Once your campaign is booked, just point your creative team to our site for download of good billboard design templates so they can produce production-ready creative.